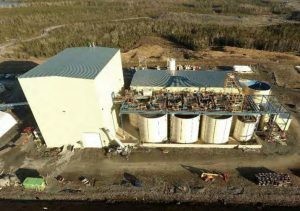 NOVA SCOTIA – Vancouver-based Atlantic Gold Corp. has completed the second phase of its life of mine expansion for the Moose River Consolidated (MRC) pre-feasibility study. Production is to be increased to 200,000 oz./year at an all-in sustaining cost of $692 per oz. (US$555/oz.). Atlantic plans to mine its Fifteen Mile Stream (FMS) and Cochrane Hill (CH) deposits as satellite operations to the Touquoy central processing facility near Halifax. The official opening of the MRC project and Touquoy mill took place in October 2017. The company has given 2018 guidance as between 82,000 and 90,000 oz. of gold from the Touquoy and Beaver Dam deposits. Both FMS and CH will be conventional truck and shovel pits with a pre-concentration plant at each location. Development will be phased beginning with FMS and followed a year later by CH. Proven and probable reserves for both deposits total 22.0 million tonnes grading 1.17 g/t gold for 825,000 oz. The Touquoy and Beaver Dam deposits together have an addition proven and probable reserve of 16.5 million tonnes at 1.44 g/t gold for 760,000 oz. More information about a Moose River is posted at www.AtlanticGoldCorporation.com.